Album Review: Muse - Simulation Theory - GENRE IS DEAD! 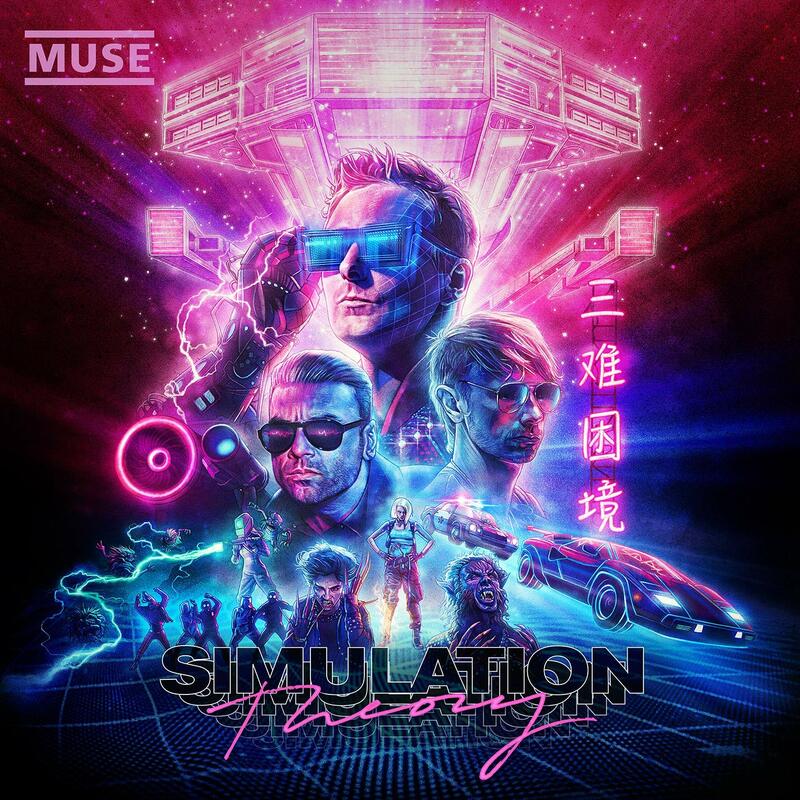 Simulation Theory, the 8th studio album of Muse, is different. Not only in regards to the music, but also in regards to the process of the album. Rather than concentrating on the album as a whole, which Muse usually does, they decided to focus on recording and mixing one track at a time. This resulted in a couple of single releases accompanied by music videos before the album was dropped. On the 18th of May 2017, the first single “Dig Down” was released. I recall I didn’t like the song when I first listened to it. The song has a lot of synthesizers in it and even though you also can hear they are experimenting again, I didn’t like the sound of it. It felt as if the song could do and have so much more. To me, it felt unfinished. Then, more than half a year later on the 15th of February this year, their second single “Thought Contagion” was released. What a difference it was compared to “Dig Down”! I immediately liked the sound of it; darker, more critical and just more what I personally expected of Muse. The lyrics perfectly fit in a world where more than ever our thoughts are influenced by the media and people around us. After that, on the 20th of July 2018 together with the announcement of the Simulation Theory’s release date, came “Something Human”, followed up by “The Dark Side” and “Pressure”. These three songs are just like what “Dig Down” and “Thought Contagion” had; totally different from each other. “Something Human” sounds more like a pop song. It’s very simplistic and easy-going, and describes the tiredness of touring all the time and having a feeling of homesickness. “The Dark Side” kind of feels like the Disney movie Tron from 1982. You can clearly hear the song is being influenced by the 80’s. My favorite of these three tracks and my favorite of the whole album is “Pressure”. It’s catchy, it’s powerful, and it has cool sounds effects with horns and awesome guitar riffs. The song reminds me of “Panic Station” off The 2nd Law which I absolutely adore. Five songs before the album release. Five songs that all sound so different from each other so that you had absolutely no idea what the album would sound like. Before I listened to the complete album, I already got an idea of the sound via the description of a colleague who had already listened to it. According to him, the album is quite weird, with so many different styles and influences. He mentioned one song reminds him of Prince, another one has influences of Rage Against The Machine, and yet another one has a Linkin Park vibe to it. There are also songs that are clearly influenced by 80’s pop culture. I must say, his description is quite accurate. Let’s have a look at the songs we haven’t discussed yet. The album starts off with “Algorithm”. It’s a slow but determined introduction into the album. The song feels like the soundtrack of a threatening dystopian science fiction movie. The same goes for the last song of the album, “The Void”. The song has the same atmosphere as “Algorithm” but the chorus hits a more pop song direction. There were two moments whilst listening to the album at which I actually screamed out loud “WHAT THE #*@^?!”. This was during “Propaganda” and “Break It To Me”. I mean, I know Muse is a band that likes to experiment and I’m all for that. I’m also very open minded. But for me, listening to it for the first time, it was really too much. “Propaganda” opens up with the word ‘propaganda’, accompanied with heavy guitar riffs. So you would expect something heavier. Instead, the song suddenly transitions into something similar to a Prince song. The track is smooth, has sound effects and is just, well, weird. Then, when you think the weirdness is over, you get “Break It To Me”. The songs starts off with guitar riffs as well, and has a very distinct beat. For me personally, I would describe the song as “Destiny’s Child-meet-Justin Timberlake” with an extra flair of Middle Eastern instrumentation. On top of that, there are futuristic sound effects. The two rockiest sounding songs on the album are “Get Up and Fight” and “Blockades”. “Get Up and Fight” really sounds like something Linkin Park could have in their repertoire as well. “Blockades” is a great song for all those fans who don’t like experimental music that much and just want to listen to some old Muse style songs. The chorus is like a slower and heavier version of “Uprising” from The Resistance. There are two things apart from the music that really stand out on Simulation Theory: the album cover and the music videos. Let’s first have a look at the album cover. Designed by British visual artist Kyle Lambert, who has worked on the television series Stranger Things, the album cover pays homage to the 1980’s pop culture entertainment and aesthetics. As someone who has studied Chinese language and culture, I was quite surprised to find 三难困境 (sān nán kùnjìng) written on the right side on the cover. Supposedly sān nán kùnjìng is the Chinese translation for ‘impossible trinity’ or ‘trilemma’, referring to “a concept in international economics which states that it is impossible to have all three of the following at the same time: a fixed foreign exchange rate; free capital movement; and an independent monetary policy” (source: wiki). Maybe this is a message Muse wants to convey to the public. It’s interesting to think about, since most of the lyrics on Simulation Theory are informed by the contemporary political climate of the United States. Muse is planning to produce music videos for all the eleven tracks on the album. What can be said about the music videos thus far is that the 80’s nostalgia is overly present. Each video is directed by American filmmaker Lance Drake. In the videos we see tributes to the music video of Michael Jackson’s Thriller, movies such as Back to the Future, Teen Wolf, Gremlins and Ghostbusters. Overall, the eleven different songs blend perfectly together as a whole. Simulation Theory is heavily inspired by the 80’s pop culture, especially movies from that era. Listening to it at first, Muse experiments, creates and re-creates. The album is available on digital, vinyl, CD, cassette and super deluxe box set.